So, I’ve spent 11 incredibly enjoyable years as a semi-hermit. Now I’ve decided to make public appearances again, help the poker industry innovate, and gradually try to return to the spotlight. 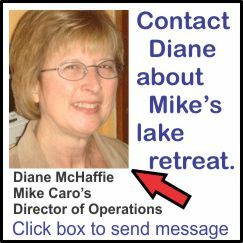 Since I recently moved in with Diane, six miles away on the same lake, this is a good time to sell my Ozarks retreat. It was intended as a getaway and turned out to be a treasured full-time hermitage. But you’ve probably already read about that in the other sections. Below, I’ll try to answer questions you might have. → Is the price negotiable? → How much are utilities? → Is it safe living here? → How are the schools? → What are the politics? → Will police harrass me? → Can I buy without the extra 10 acres? → Is there dock zoning? → Does the lake ever go down? → How often does the stream flow? → Is this a tourist area? → What are the people like? → Where can I shop? → What are the property taxes? → How expensive is insurance? → What are local job prospects? → Do most people own guns? → What are the main area attractions? → Is everyone conservative in the Ozarks? → Is there friction between natives and outsiders? → Are you allowed to be on the lake at night? → Is there gas, besides electricity? → What if the well runs dry? → How good are the health services? → What places can you visit within a day’s drive there and back? → What improvements could be made to the property? → Will UPS and FedEx deliver to the house? → What about earthquakes, fires, and tornados? → Is it safe to walk in the woods? → Is it safe to swim in the lake? → What about Internet service? → Do you get cell phone service on the property? → What’s the weather like? → If I buy the property, will you and Diane still answer questions? Answer: Don’t be embarrassed to make any reasonable offer, but I’m anticipating a sale at or above the full asking price, depending on immediate interest. The real estate agent who first listed the property advised $740,000 for the complete 41-acre package — and it was offered for three months at that price in 2012. The retreat with the 31 original acres was listed for $699,000. By the time I decided to list it again, the lake was unusually low and I didn’t think it would impress quite as much as it normally does. So, I lowered the price dramatically. Even though the lake is now back to normal levels, I’m pricing the 41-acre package at $466,000 — and just $395,000 for the original 31 acre package. My friends think this is crazy. So, I’d be reluctant to go much lower. If it doesn’t sell quickly, I intend to take it off the market and list it later at a significantly higher price, when the economy improves. Note to licensed real estate agents: You are welcome to make arrangements to show this property. However, the selling price would need to be a bit higher to accommodate the commission. That’s because, I’ve already drasitcally lowered the price for a private sale from the original realtor-listed $740,000 for the 41-acre parcel. Answer: The only required utility cost is electricity, which is cheaper than in most areas of the country. I was a heavy user, choosing to leave the air conditioner at 69 degrees in summer, heat heavily in winter, leave several heavy duty computers running around the clock, and enjoy all manner of electronics. My bills for the main house averaged about $300 a month. The cabin came in well under $100, even when in use. My guess is that a typical couple or small family would pay around $350 for both house and cabin, assuming they are occupied.. In fact, I got charged extra because my electricity usage was high relative to the previous owners. I know, I’m supposed to be conserving energy to save the environment, but you can yell at me some other time. I’m just trying to truthfully explain the situation. And I promise to be more conscientious in the future. There’s also trash service available for about $20 a month. I used it, but you might not need it. Answer: Yes. It’s much safer than in large cities. Answer: Pretty good. I don’t have children, but friends I have here do. The public school system is well above city standards and teachers tend to be caring and take an extreme interest in education. There are private schools nearby, too. The only major colleges are Missouri State in Springfield, Missouri, the University of Arkansas in Fayetteville, and College of the Ozarks near Branson. College of the Ozarks is a Christian school. Many major colleges are within 200 miles or so. Answer: It seems like half of California, if you ask the locals, but that’s because Stone County hasn’t had much growth until recently. But now the area has been discovered and people are trickling in from major population centers across the country. Answer: Mostly Republican, but about 30 percent of Stone County voted for President Obama. There’s also a lot of libertarians, and I drift in that direction myself, if you must know. Answer: I included this question because several of my friends in California have asked it. The answer is decidedly no. This isn’t a backward area like you see in the movies when cars travel through the back roads of Mississippi. I guess that’s the reason for the question. This is a huge tourist area, and the local police are different. They tend to be more helpful than authoritarian and treat you as neighbors and equals. It’s culture shock in a positive way. Answer: Yes. But you can’t buy the 10 acres separately unless the the buyer of the property doesn’t want it. The property can be bought without the 10 acres for $699,000 $395,000. I’m only asking $39,500 for the extra acres. But if I sell them separately, it’s $55,000 — and I won’t know if they’re available until I sell the main property. I would expect some buyers to want the additional 10 acres, because it blends perfectly and joins a large border with the original 31 acres, with paths winding unnoticed in and out. The extra acres also afford another way to enter and exit from the dwellings, and you could even build a second driveway. Also, the 10 acres are in a newly proposed subdivision with dock zoning, giving access to a boat slip, when a dock is built. Answer: Yes, with the additional adjoining 10 acre lot in a planned subdivision. There was no dock zoning when I bought the property. A dock is planned in the community. Answer: Yes, but not often. In my more than 11 years here, it’s never been low in the summer, but several times it has been in other seasons. The water gets unusually high more often than it gets unusually low. See my other discussions about this. There are photos of the lake at high and low levels in the “All photos” section. Answer: I would guess only about 25 percent of the time, but sometimes for many days or even weeks. It depends on the rain. Answer: Definitely, but you’d never know it if you stay near home. It isn’t just any tourist area, it’s the ultimate tourist area for a large portion of the United States. Branson is the main attraction. You might not even have heard of Branson in Los Angeles or New York, a truth that seems incomprehensible to people out here. I wasn’t very familiar with it, either, until I began to research Table Rock Lake, prior to purchase. But the crowds and bustle of Branson are out of site on the retreat. You’re within half an hour of activity, but you won’t notice. There are many other tourist attractions nearby, too. Answer: My happiest surprise was that most people here are the opposite of what I’d expected. I’d thought that, as an outsider, the long-time residents would be standoffish or indifferent to me and that I’d need to reach out to change attitudes. I was surprised to find an immediate friendliness and acceptance unlike what I’d experienced anywhere else. I even feared that the fact that I was a poker player and not even a churchgoer might be frowned upon in the Bible Belt. Instead, I was received only with curiosity and kindness. The neighbors are beyond trustworthy, and I left keys with them to use in an emergency when I was away on business or making public appearances. All the closest neighbors are at least an eight minute walk away. And they’re the kind you dream about. Helpful, friendly, but always respecting your privacy and seclusion. Stone County itself has a mix of people: Retired folks, farmers, families, a large influx from neighboring states, California, Illinois, and elsewhere, an increasingly smaller redneck element, conservatives, libertarians, and even a liberal minority. I guess I’d watched too many Hollywood movies, because I suspected the native residents might be hostile to other cultures and minorities. Well, I’m happy to report that this isn’t the deep South of the 1960s. Although, there’s not much racial diversity, there’s also no hostility whatsoever to non-white tourists and those beginning to settle here. My then-wife Phyllis is Jewish and, while I got the feeling some residents hadn’t had any exposure to that, she was assured that there was a synagogue in Springfield. Of course, that’s an hour and a half away. She doesn’t attend often, anyway. Besides, this was going to be only an occasional escape, not my full-time residence — which is what it turned out to be. You’ll probably be quite comfortable with the people here. In 11 years, I haven’t witnessed one public argument. When I tell that to my California friends, they think I’m making it up, but it’s true. Answer: Forget about big-city shopping nearby. There isn’t much in the way that you’re probably used to having. There are local shops, convenience stores, restaurants, gas stations, and even supermarkets, though. And there’s a 24-hour Walmart Super Center just 12.8 miles away in Berryville, Arkansas. For more serious and upscale markets, you’ll drive to Branson, about 40 minutes away, where there is a classy Branson Landing mall on Lake Taneycomo, many stores, and outlet malls. There you’ll find a Best Buy, bookstores, and all manner of essentials. Go 40 minutes further to Springfield, Missouri and you’re in a great shopping area like the ones you’re used to in big cities. Or you can go in the other direction, about the same distance from home, to a major shopping area in Arkansas. I’ve learned to rely on the Internet. Using my Prime membership on Amazon.com, almost anything imaginable comes delivered to my door in two days, with free shipping and no taxes added. Answer: Under $1,700 a year, including the adjacent 10 acres. → Is the cost of living high or low here? Answer: Very low for gasoline and hiring help, among other things. However, wages are low, too. Answer: Home insurance is relatively low. Car insurance is very low. Answer: Pretty dismal. There are low-paying jobs, but not many high-paying ones. This is more of an area to retire, own your own business, use for vacations, or work from home. You could also go the bed-and-breakfast route. Answer: Yes. And they handle them safely and with great respect. Not everyone owns guns, but if you’re looking for a gun-free zone, this isn’t it, as quickly became apparent to me. Oddly, you don’t hear guns fired often, except in the hunting seasons. Answer: No. There’s an enthusiastic group of hunters, but most people don’t hunt at all here — especially the newcomers. I’ve never hunted, so you might be asking the wrong person for statistics. Answer: World class. Table Rock Lake is famous for fishing. Answer: Branson, Missouri for country music, other entertainment, restaurants, and more; Eureka Springs, Arkansas for relaxation in a quaint 1800s environment among a mix of artists and counter-culture; Big Cedar resort; additional close-by lakes; Dogwood Canyon; Silver Dollar City theme park; and much more. I talk about these in the other sections. The property is about midway between Branson and Eureka Springs, less than 30 miles in either direction. Answer: Absolutely not, but voting leans solidly Republican. Answer: They’re everywhere. Most faiths are represented, with Baptist being the dominant choice. Answer: Of course. That’s another California question, right? They don’t roll up the surroundings at sunset here. Answer: It’s available through propane delivery, but you’d have to hook it up. Most homes here are all-electric. Answer: It won’t. Most of the Ozarks rests are a huge aquifer The well was drilled extra deep, just for good measure. Answer: Area hospitals are well respected. There are small facilities in Berryville and Shell Knob nearby and a large hospital in Branson. Major hospitals are in Springfield. Answer: Oklahoma City, Tulsa, Kansas City, St. Louis, Memphis, and many more — even Dallas. And that’s just the cities. Check your map in the morning and plan a new adventure. That’s what I sometimes did. Answer: The home is immediately livable. You will want to get new shingles in the coming years, because — although they still do the job — I’ve never replaced them (except over the second suite I had added). Labor for that is much cheaper here. You might want to replace the carpet, because it won’t be everyone’s style. Many people don’t like acoustic (a.k.a. “popcorn” ceilings), and if that’s you, think about replacing those with plain paint. I like them, especially here in the country. You could convert the three-car carport/patio to interior living space. You could add propane gas, to supplement the electricity. Most people here don’t and prefer all-electric homes. You could add a back-up generator. And I guess I could think of more. But I liked it just the way it is. If you want projects, I’ve suggested some. If you don’t, leave it alone and enjoy it. Answer: No significant earthquakes, although there was a famous one in the 1800s on the other side of Missouri. Forest fires aren’t much of an issue, because the vegetation is seldom very dry. Small tornadoes have struck in flatter areas nearby, including near Branson in 2012, but this isn’t tornado alley. There was a major tornado that hit Joplin, Missouri just 92 miles away by road in 2011. Answer: Yes. There are no bear or mountain lions that will eat you. If you journey off the paths in the tick season, you should use a spray sold almost everywhere here. Either that or take a shower within two hours. And you might encounter snakes. But I personally have never met up with one in my woods, though I’ve seen several (dead and alive) in the roadways — and even a couple crossing the driveway. I feel totally safe in my forest, but if you’re not looking to put city life behind you occasionally, you probably won’t enjoy the woods or the paths the way I do. Answer: Yes. People swim and water skii in Table Rock Lake. Almost nobody comes down the arm of the lake where the property is, though. It’s pretty remote by boat. Answer: There is DSL available through CenturyLink. Top speed offered so far is 1.5 mbs, with promises of greater speed in the future. That’s enough for fast web page loads and YouTube, but I wouldn’t mind more speed, because I work all day long with computers. There are two DSL lines coming into the main house. Additionally, both the house and cabin are wired for networking, but you’ll probably choose wireless routing. CenturyLink has a temporary waiting list for DSL, but you can possibly talk them out of that if you explain the wiring is already installed. If not, there’s the even-faster HughesNet satellite service. I had that when I first moved here. Dial-up? Yes, there’s that, too, if you don’t need broadband. Answer: Cell phone service on the property is hit and miss, so you have to find your spots. You do get weak reception in the house, so you can buy an inexpensive cell phone signal booster, if that’s an issue for you. Answer: There clearly are four seasons here, but the winters are much less severe than in big midwest cities like Denver, Kansas City, or Chicago. The property is further south, almost in Arkansas. I sometimes wish it would snow a little more than it does, but you’ll average three or four snowstorms a year. Sometimes more; sometimes none. The hottest summer days can hit 100 degrees Fahrenheit, often with high humidity. But, this isn’t south Florida, by any means. The temperature is usually tolerable in summers and quite pleasant in the spring and fall. Rain seems to often come unexpectedly in spring and fall. Answer: Of course. If you need to know where anything is, how it works, what restaurants we recommend, more about living here, who’s good to hire for whatever, or almost anything else, we’d be delighted to help you through the transition. Just ask. Beautiful presentation Mike. I envy you for having enjoyed your solitude and privacy for so long. If I buy the property and begin living there, will Diane Mchaffie continue to spend a lot of time there?